This operational pilot is the smallest in the range of applications, demonstrating the added value of Vehicle-to-Grid (V2G) and additional storage for optimised energy generation and consumption in households. 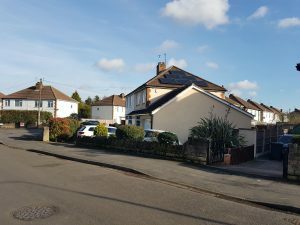 A single household was progressively equipped with ‘smart’ technologies, beginning with solar panels and an electric vehicle and later adding stationary battery storage and a bespoke V2G charging unit. The incremental addition of smart technologies has enabled the true impact and value of each to be assessed both individually and in combination, giving a better idea of how the technologies interact and whether they compete or complement each other. This will enable future home owners to identify the best technology combinations to meet their needs. The V2G unit is a research prototype, but it is intended that the learning from this project will support the future development of commercially available domestic V2G units. While the EV was parked at home, the V2G unit enables the vehicle to charge using excess solar generation and return the power to the home when it is required. The V2G charger can also vary the response to match household’s electricity demand and the solar energy production forecast. As a result, it is expected that the distance travelled by the EV using zero emission PV generation will increase, while minimising the homes overall demand. The house in question is the home of ‘Steve’ and his family. Steve is an employee at Cenex. This was done as it allows the system to be monitored and exercised more readily than in a normal commercial trial and it enables equipment to be tested prior to going through full CE testing. This also provides a number of additional advantages including easy access to user feedback on the system, and the collection of contrasting views from different family members with different needs and expectations of the system. According to Steve “Being part of this trial has been a real eye opener and helped me see the value of the different technologies. I’ve really enjoyed knowing that I’m getting the most out of my PV”. Overall this ‘Living Lab’ experiment has enabled the trialling of cutting edge systems in a safe, monitored environment, while also allowing collection of high quality data which will be invaluable in the future development of domestic V2G systems. © 2018 SEEV4-City, All Rights Reserved.